Everything you need to build, host and manage a website is available at just 60/mo. अभी नही तो कभी नही. Now 25% 50% 25% OFF! 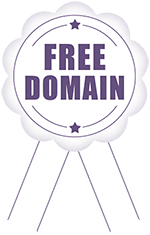 Free Domain One free .COM or .IN Domain with purchase of every new Value or Unlimited plan for 1/2/3 years. Domain will be free till the web hosting plan remains in active status. We provide you all the best web hosting features in India that others are missing. Lifetime Free DomainBuy Value or Unlimited hosting plan for minimum one year and get a .COM or .IN domain name free of cost. The domain name will be free till the time your hosting account remains active with us. Free SSL CertificateWe provide free SSL certificate with every cheap web hosting India plan. SSL secures your website and improves your website ranking. In the web browser, a green padlock and https protocol will be visible. 1-Click InstallerAt a few clicks you can install apps like WordPress, Joomla, Drupal and over 400 such apps using Softaculous 1-click installer. It's integrated into cPanel control panel offered with our cheap web hosting India plans. Latest PHP & MySQLWe have latest and stable version of PHP and MySQL installed on our linux shared hosting servers in India, UK and US. Instant Account SetupGo online instantly! All cheap web hosting packages are setup immediately upon payment confirmation. Datacenter ChoiceWe provide premium web hosting services in India, UK and US. At the time of sign-up, choose your preferred server location. The Indian clients, targeting Indian visitors, should choose India server location. High performance Linux VPS powered by DigitalOcean. Get more control and power to run your website and apps. We provide DigitalOcean, Jelastic and Amazon cloud services. Try our Jelastic cloud platform free for 7 days. MilesWeb is an Indian web hosting service provider. We know our people and understand their requirements better than others. Feel free to communicate with our team in English, Hindi or Marathi language. Solving your problems is our top priority. For best network connectivity, uptime and security we have our servers located in state-of-the-art datacenter in India, UK and US. We use Indian payment gateway. You can pay using Indian bank account, credit or debit card, net banking, NEFT, cheque or cash deposit. Pay for cheap web hosting India services in INR. Change in currency rates will not affect the hosting charges the way it affects when you pay in USD. MilesWeb is operating since 2012 but the team running the show has over a decade experience in the Indian web hosting industry. You are 100% in safe hands. We provide one .COM or .IN domain name free for lifetime with our Value and Unlimited web hosting plan. To avail the free domain client must order the Value or Unlimited hosting package for minimum one year. Client can either register a new domain or transfer an existing domain to MilesWeb. Client must add the free domain to the shopping cart before making the payment for the web hosting plan. Choose our cheap web hosting India plans and book your free domain now! We provide unlimited disk space and unlimited bandwidth with our unlimited cheap web hosting plans. Our aim is to empower the website owners by offering them flexible and scalable web hosting solutions in India with no disk space and bandwidth limits. We have not set a cap on disk space or bandwidth usage. The web hosting users must comply to our TOS and Unlimited hosting policy. We will not restrict the user on space or bandwidth required for the normal functioning of the website. This doesn’t mean that large websites that are suitable for running on a Virtual Private Server or Dedicated Server will be accommodated on a cheap web hosting platform. The unlimited web hosting plan is recommended for small and medium size websites. It’s very rare for a user managing such website to exceed our usage policy. Choose our unlimited cheap web hosting India plans to launch your website.